For an engaging event that you won't forget, book my magical show. 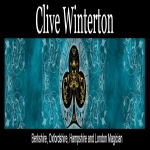 I'm Clive Winterton, an award-winning magician based in Reading, Berkshire, that provides engaging entertainment for events, weddings, and parties. My style of magic is captivating and fun, making your audience ask for more. As a member of The Magic Circle and a party entertainer, I belong to a fascinating world of magic and illusion. Your guests are sure to remember your event for a long time. Specialising in close-up magic, I combine a striking personality with a sharp sense of humor. I was awarded 'The Home Counties Most Entertaining Magical Act' for my efforts.